After the explosion of the SpaceX Falcon 9 rocket on the launch pad on Thursday, September 1st, Spacecom is now developing a plan of action following the loss of their AMOS-6 communication satellite—the firm has initiated measures to recover the funds that had been invested in the project. 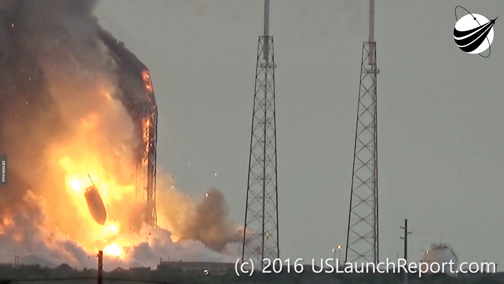 The company's management is reviewing the situation following the loss of AMOS-6 which occurred while SpaceX's Falcon 9 rocket suddenly exploded on the launch pad at 09:07 U.S. EST on Thursday, September 1, 2016. Importantly, David Pollack, Spacecom CEO and president, said, "Spacecom has crafted a plan of action which represents the foundation upon which we shall recover from AMOS-6's loss. Our program includes, among other measures, exploring the possibility of procuring and launching a replacement satellite. Working quickly and efficiently, management is engaging with current and potential partners to move forward. Spacecom will serve all of its current and future financial commitments." A photo of the SpaceX Falcon 9 fairing containing the AMOS-6 satellite payload crashing to the launch pad following the explosion of the launch vehicle on September 1st. Photo is courtesy of USlaunchreport.com. 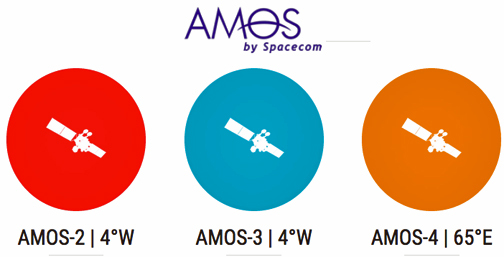 Some of Spacecom's current Ku-band clients on AMOS-2 that were to be relocated to AMOS-6 will be relocated to AMOS-3. For others, the company is planning to help find capacity on other satellites or possibly on a satellite that will be relocated, either permanently or temporarily, to the 4 degrees west orbital position. A condition of Spacecom's merger with companies from the Beijing Xinwei Group announced on September 24, 2016, was the AMOS-6's successful launch and completion of in orbit testing. Spacecom has updated Xinwei regarding the loss of the satellite and together the parties will explore possibilities to amend the current agreement to reflect the new situation. Spacecom (Space-Communication Ltd.) operates the AMOS-2 and AMOS-3 satellites that are co-located at 4 degrees West, and AMOS-4 at 65 degrees East, which provide high-quality broadcast and communication services to Europe, the Middle East, Africa, and Asia via DTH and DBS operators, Internet service providers (ISPs), telecom operators, network integrators and government agencies.